Our client for this project wanted to create a space for her two teenage daughters, both avid readers, to use their imagination as they devoured the latest adventure novels. 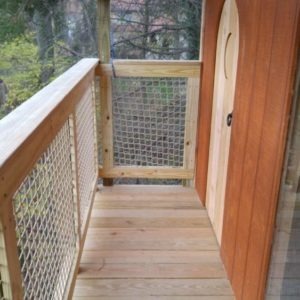 This treehouse is very sturdy and built to last, with the same tree friendly methods as our more expensive projects. The siding is T-11 with a reddish brown stain. The roofing is powder coated steel which comes in various colors. The swings and hammocks inside are accessories that we can supply for you or use ones you already have. 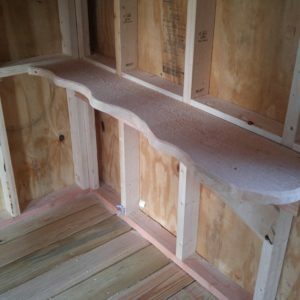 Square and rectangle shapes keep the labor and material costs to a minimum, which get you the lowest per square foot cost for a treehouse. The porch is a nice add on, both for appearance sake and for activities like hoisting up supplies, launching water balloons and paper airplanes, and watching birds and animals move around. 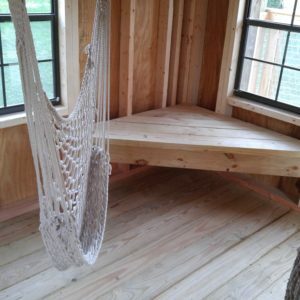 We can build basic treehouses anywhere from New Jersey to New Guinea, but we also can supply plans and hardware packages if you are a very long way from our headquarters in West Chester, Pennsylvania, USA. 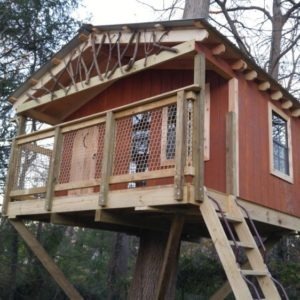 How Much Does this Treehouse Project Cost? While treehouse costs vary greatly and each project is unique, we understand your need to have some idea what each project in our portfolio would cost to build. Please see our tree house pricing page for a description of the factors that go into each quote. 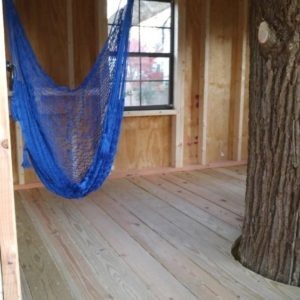 This tree house as shown would cost between $19,000 and $30,000. Please feel free to contact us to discuss whether your project would fall on the high end or low end of this range.